The Herald Sun Times covers The Relative Pitch!!! 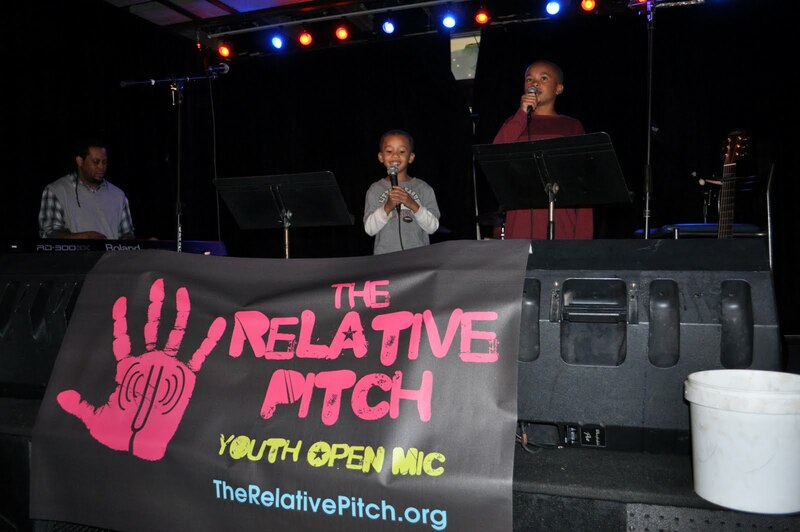 Relative Pitch series begins SundayDURHAM – Triangle-based singers Rissi Palmer and Kim Arrington have started The Relative Pitch, a monthly open mic for youths. 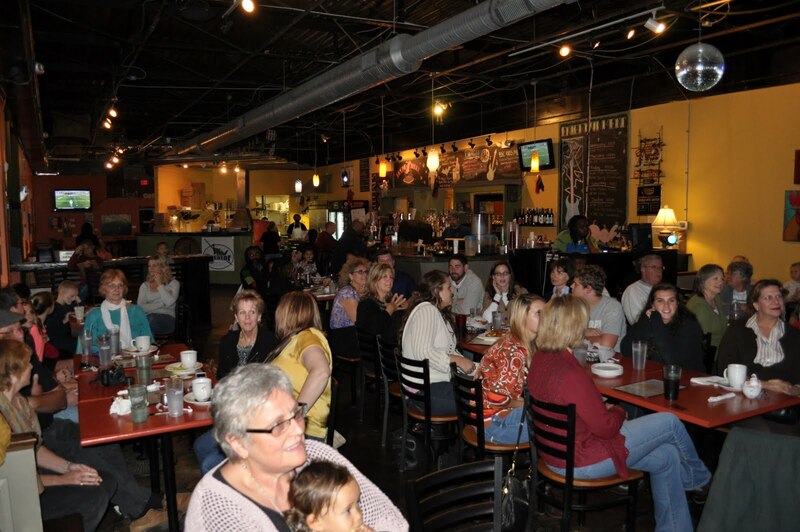 The opening night is Sunday at The Broad Street Café, 1116 Broad St. from 4:30 to 6:30 p.m. The event is free and open to the public. Donations are welcomed. Palmer is a Billboard-charting, country singer-songwriter whose new children’s CD, “Best Day Ever,” will be released this year. 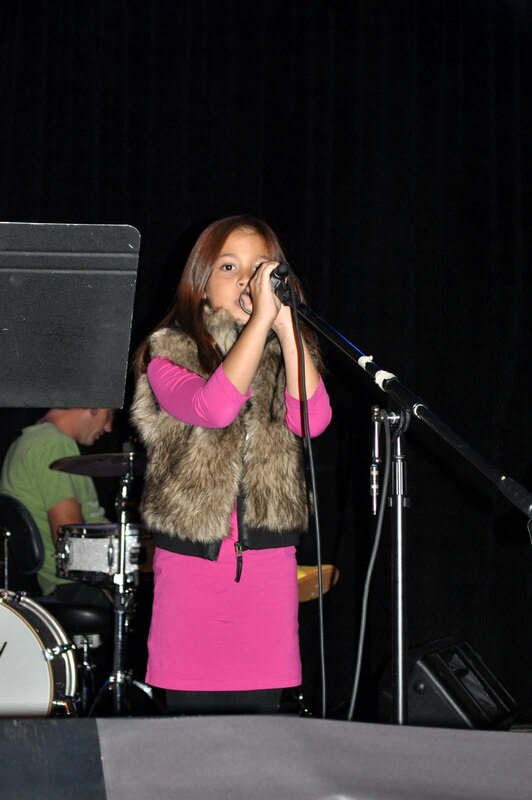 Palmer had the idea to start The Relative Pitch from voice students she teaches at The Grace Note Music Studio in Raleigh. Palmer approached Arrington, a well-known teaching artist and singer who has toured internationally, to help organize The Relative Pitch. 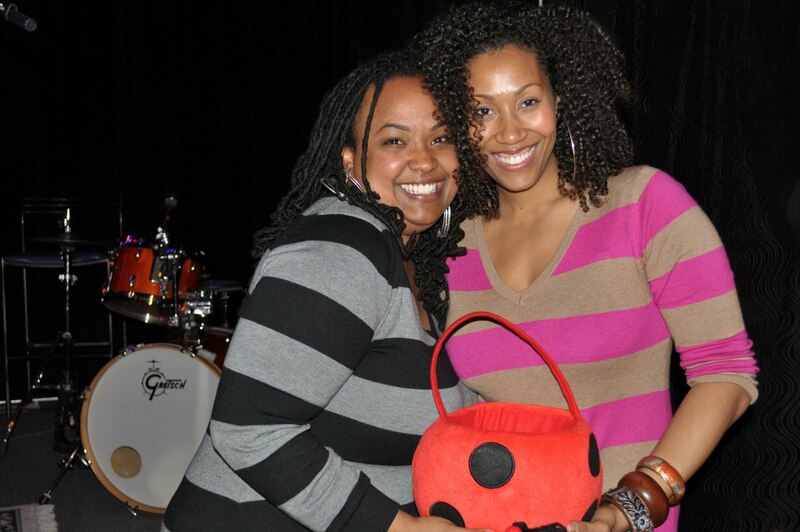 Arrington, who will be releasing a new CD, “Getting II Yes” in 2013, said she wants to nurture the next wave of local talent. 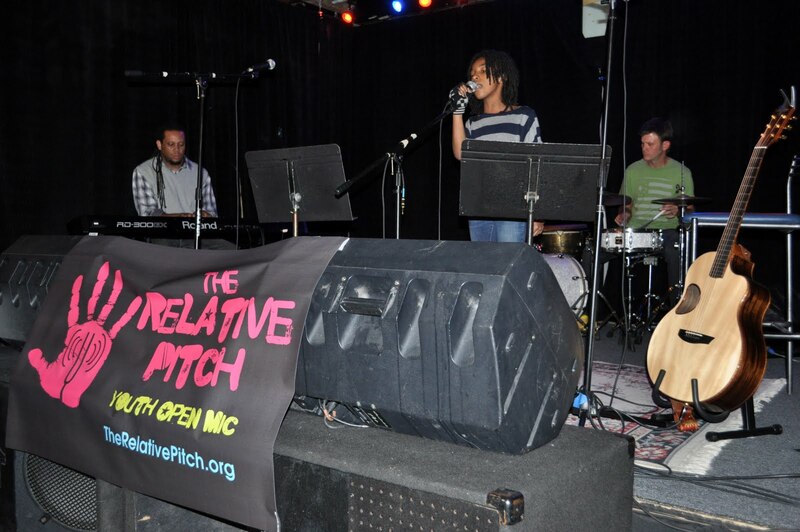 The Relative Pitch will be presented at The Broad Street Café Nov. 11 and Dec. 9 from 4:30 to 6:30 p.m. More dates will be announced for 2013. 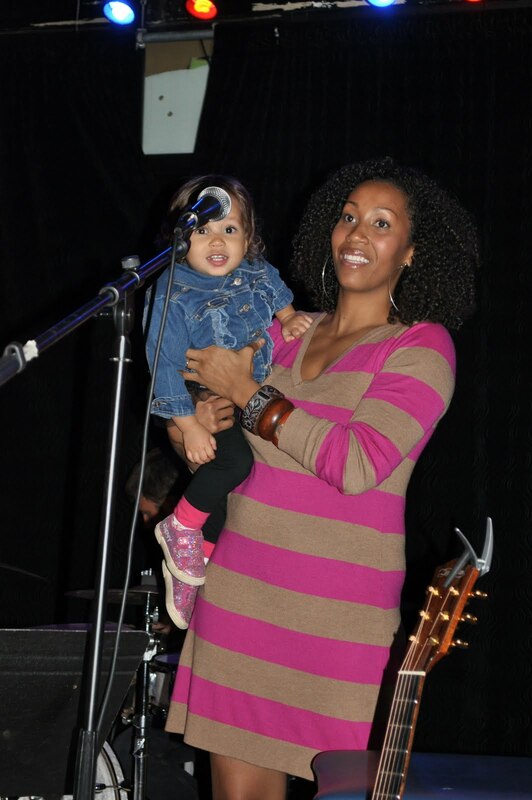 The Broad Street Cafe in Durham, which already offers a great family music series a couple of Sundays each month in the fall and winter, will launch a new open mic program for kids 18 and under on Sunday. 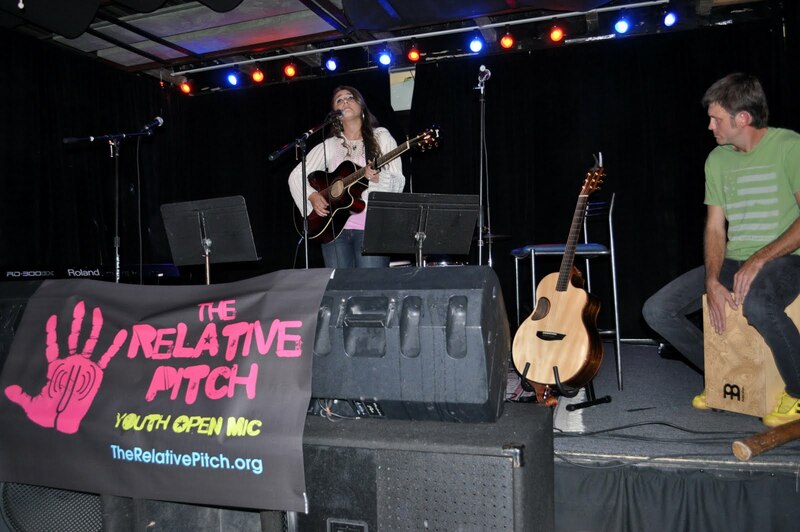 The Relative Pitch was created by Rissi Palmer and Kim Arrington, both recording artists and teachers. It’s described as a performance workshop disguised as an open mic for kids 18 and under in the Triangle. The once a month, two-hour show is “designed to give up and coming musicians and singers a place where they can hone their skills in front of a welcoming audience of their peers and families and fill a void for places for young people to perform that aren’t intimidating or adult oriented,” according to the website. “When Rissi called, I had just finished teaching at a Rock Band camp in Carrboro for 11 to 15-years-olds. The kids told me they had nowhere to perform locally, and adult open mics were too scary. We want to teach the kids through The Relative Pitch, that indie artists create their own solutions, for themselves and their communities,” said Arrington in a press release. Palmer and Arrington bring a lot of experience to the program. When she isn’t recording or touring, Palmer, who is a mom, teaches young singers at The Grace Note, a music studio in Raleigh, and is writing and recording an album for children. There’s a snippet of a song on The Relative Pitch’s website that is really sweet. 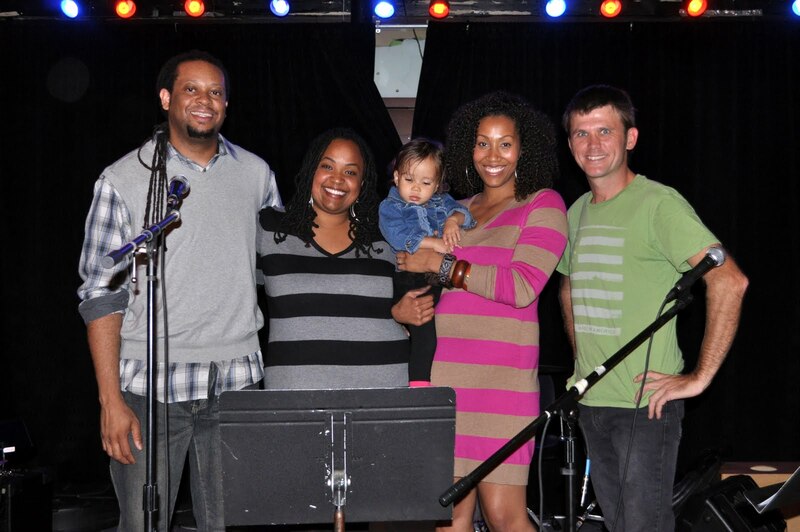 Arrington sings soul, jazz and rock with The Kim Arrington Band. She is working on her second CD, has taught thousands of students in North Carolina in poetry, playwriting and songwriting and is a former faculty member at Duke’s Young Writers Camp. The first session is Sunday at the Broad Street Cafe in Durham. Doors open at 4 p.m. Performances start at 4:30 p.m.
For details, check The Relative Pitch’s website and Facebook page. The Relative Pitch in the News!!! Rissi Palmer and Kim Arrington launch The Relative Pitch at Broad Street Café on October 28. 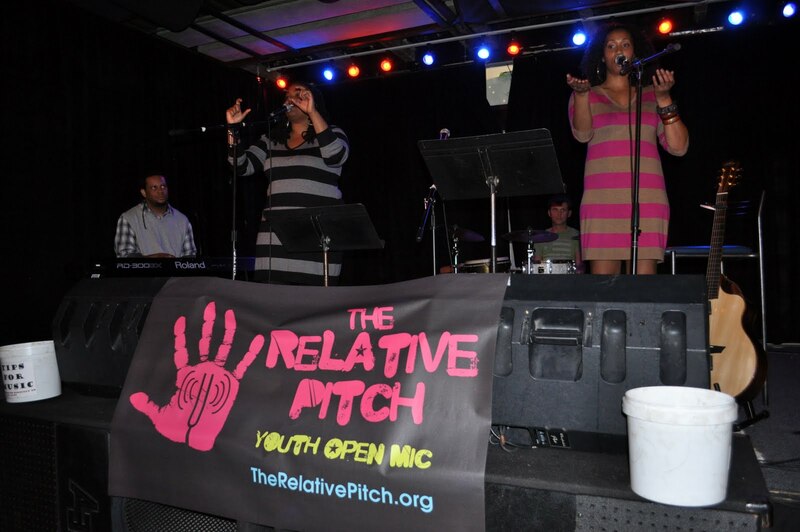 DURHAM, NC – Triangle-based singers Rissi Palmer and Kim Arrington have started The Relative Pitch, a monthy open mic for youth. 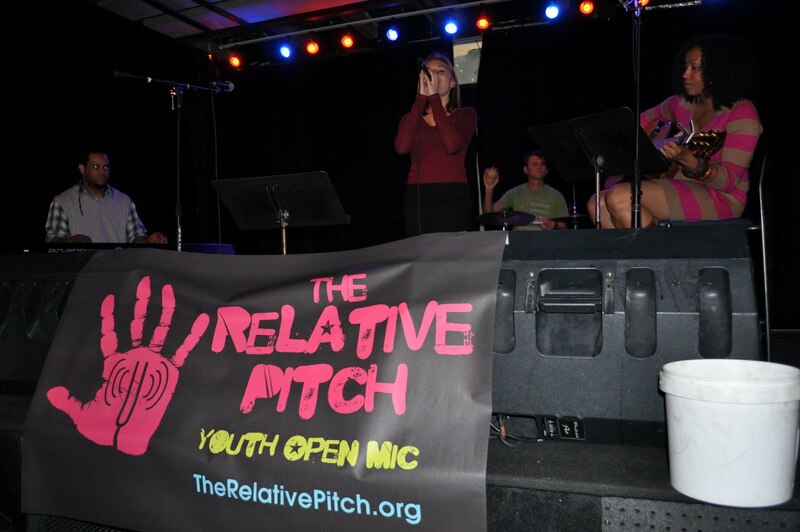 The opening night for The Relative Pitch is Sunday, October 28 at The Broad Street Café in Durham, NC (1116 Broad Street, Durham, NC 27705) at 4:30 pm – 6:30 pm. The event is free and open to the public. Donations are welcomed. Palmer is a Billboard-charting, country singer-songwriter whose new children’s CD, “Best Day Ever,” will be released this year. 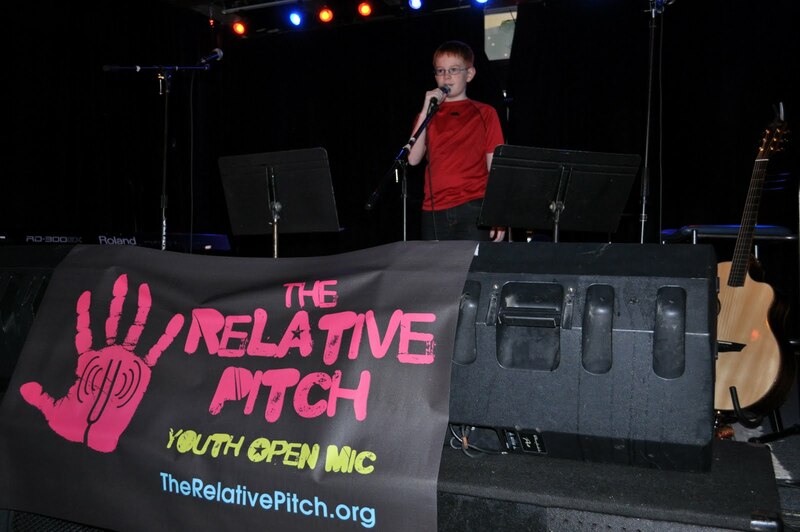 Palmer had the idea to start The Relative Pitch from voice students she teaches at The Grace Note Music Studio in Raleigh, NC. “My students told me that outside of recitals twice a year, there was really nowhere else for the kids to perform that isn’t competition based. The Relative Pitch needed to be a fun, family-friendly and a non-judgmental environment for blooming artists. The kids can expect to gain performance experience, meet other young people who are interested in music, and form community,” said Palmer. “When Rissi called, I had just finished teaching at a Rock Band camp in Carrboro for 11-15-years- olds. The kids told me they had nowhere to perform locally, and adult open mics were too scary. We want to teach the kids through The Relative Pitch, that indie artists create their own solutions, for themselves and their communities,” said Arrington. 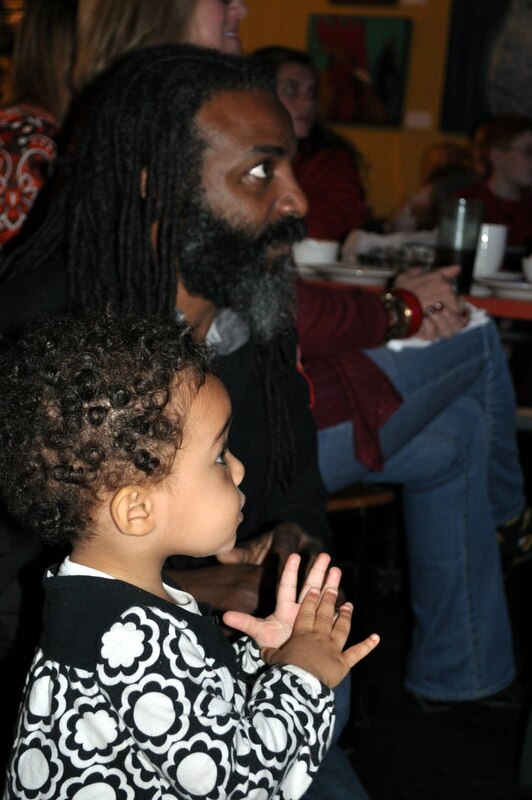 Palmer and Arrington selected The Broad Street Cafe for The Relative Pitch, because it already presents kid-friendly programming every 1st and 3rd Sunday from October to March. 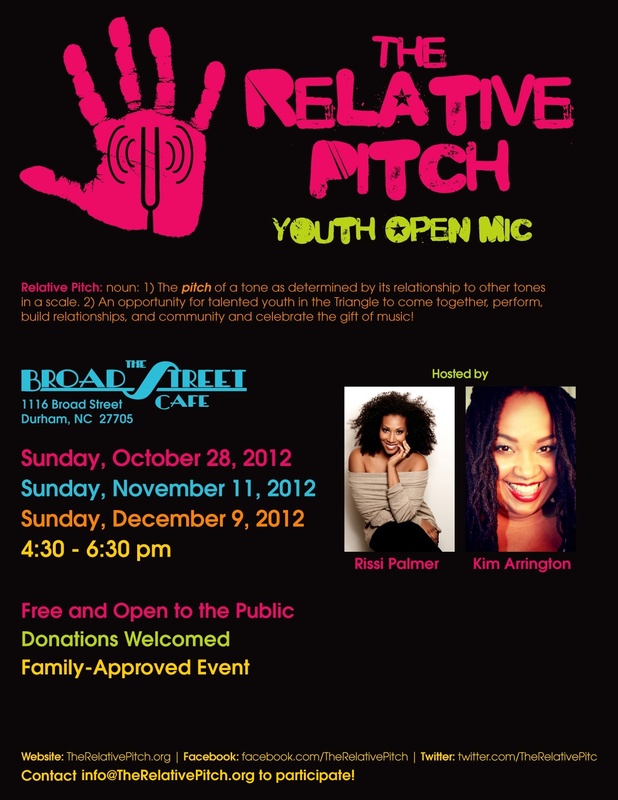 The Relative Pitch will be presented at The Broad Street Café on Sunday, November 11, 2012 and Sunday, December 9, 2012 from 4:30 – 6:30 pm. The Relative Pitch dates for 2013 are TBA. 28 Days until our first show!! !